Idiosyncratic Whisk: Labor Force Participation for "Prime Age Workers"
Bill McBride has a great piece on labor force participation for "prime age workers". This is referring to workers 25-54 years old. There is some tradition in using this indicator. But, the fact of the matter is that LFP rates for 25-29 and 45-54 year old workers is lower than it is for 30-44 year old workers. All the lowest participation age groups within this set are unusually populated right now. 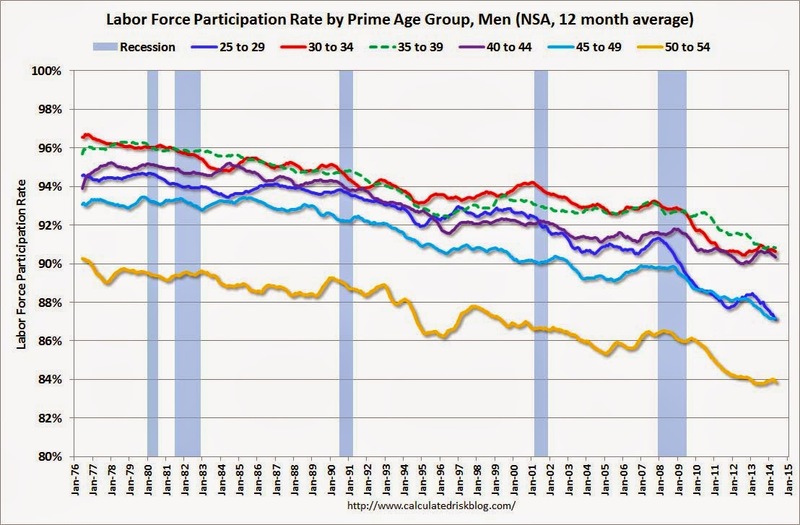 The decline in prime age worker LFP is still capturing a lot of demographic factors. Breaking LFP out in 5 year baskets, all of these age groups generally follow long term trends, except for the 25-29 year old male category, which has an unusual decline of about 2% over the past decade. So, we can debate what is happening with 20-somethings, but this just isn't a story about 41 year olds. The thing is, the data to clarify this error is readily available. There is no excuse for making this mistake. I think generally what is going on here is that the "prime age workers" category is a source of data that is seemingly credible but is currently providing a false signal for LFP pessimism. Frankly, I think an article using "prime working age" to make pessimistic points about LFP mostly just informs the reader of two things. (1) The author has a preconception that LFP has been especially bad and that the unemployment rate understates problems in the labor economy, and (2) the author hasn't taken some very basic disciplined steps to check their preconception. I don't mean to be too harsh. This is an example of how difficult analysis of the economy is. We are all engaged in a battle against our own self-dealing misconceptions and lack of understanding. If we're lucky, we might occasionally find a window into the chaos that gives us a slightly less misinformed viewpoint. In fact, here is an excellent post pointing to my possible ignorance, from soberlook, that makes a strong case that the US labor force participation has a real problem that isn't just about aging demographics. Here are a couple graphs from the article. The Canadian comparison is very compelling, although the case there does not look like it's a cyclical issue. Canada has been on a different trend than the US for nearly 20 years. I suspect that this points to our disability program that locks people into dependence. Nearly 9 million, or almost 4%, of adult Americans are on disability. Canada doesn't even have a national level program, from what I can tell. 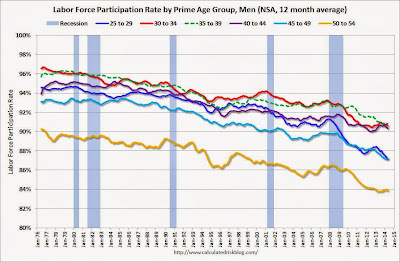 This could be pulling the labor force participation levels down for 50-65 year olds in the US in a way that makes demographics much more of a dampener here than it is in Canada, without appearing in the age group data as a significant deviation from trend. Here are comparisons of male labor force participation that I found at Fred. Much of the gap appears to be coming from the older age group that is most heavily affected by disability programs in the US. Participation is actually growing in this group, but not as sharply as in Canada. Another graph from their post appears to show a sharp change in trend concurrent with the recession among workers with less than a high school diploma, but the level of participation is significantly higher than it was anytime before about 2004. This data only goes back to 1992. It begins at about 41-42%, declines slightly, then begins climbing in the mid-1990's, until the recession. I wonder if these trends relate to Welfare reforms during the Clinton presidency and recent changes in Federal social policy that may have added frictions in low wage and marginal labor markets. The change in trend among less than high school workers is sharp enough that there is probably some policy or cyclical issue at work, but this could be similar to the disability issue, in that this is a category deceptively influenced by baby boomer demographics. Here is a graph of educational attainment over time from this article. This category is skewed toward older workers, so this is not a measurement that we would expect to be stable over time. This peak in LFP for this category could mostly be a product of a mass of "less than high school" workers reaching ages that peaked in typical LFP in the 2000's. Actually, thinking about it, this is probably much more of a factor than policy issues. Less than high school education level is fairly stable at around 11% for all age groups under 65 years. But, for 65+, it's about 19%. So, as there is generally an age-related decline in aggregate LFP, this group should have been seeing more of a demographic decline, since there is an especially large number of these workers who are now over 65. I'm surprised that LFP in this group didn't begin declining earlier. And, I would expect the demographic factor to be largely baked in at this point. If this is simply demographics, we should see this group's LFP stabilize. I still think a careful look suggests structural issues over cyclical ones, although even if the issue among the less than high school workers is structural, the structural and cyclical issues are intertwined. And don't forget,there are 3.7 million veterans on "disability." No, don't pull out the hankies. Only 200k injured in battle since and including Vietnam, and half of those returned to duty within two weeks. A huge work disincentive, especially when added to lifetime medical coverage courtesy of the VA. These are guys claiming bad backs, bad feet, bad knees, hearing loss or PTSD. Anything that cannot be disproved. Young guys to, should be working.